Notes: This TV movie has become a staple of the Cartoon Network family of TV channels in recent years. Like Mr. Magoo’s Christmas Carol, this film also uses the conceit of the familiar characters putting on a theatrical production of the classic novel by “Charles Brickens”(voiced by John Rhys-Davies). The Flintstones do much more with that concept than Magoo did, though. There are a few Flintstones-centric subplots that run through the story – Fred (Henry Corden) is so caught up with playing Scrooge that he’s ignoring his friends and family at Christmas and allowing his ego to overwhelm him. Wilma (Jean Vander Pyl) is the stage manager of the play, which leaves her hands full to begin with, but things get even worse as different members of the cast come down the with 24-hour “Bedrock Bug” and are unable to perform. Adaptations of A Christmas Carol featuring classic characters seem to be cursed – like Clarence Nash saying goodbye to Donald Duck in Mickey’s Christmas Carol, this was the final time Vander Pyl, Wilma’s original voice, played the character before her passing. Besides Fred as Ebonezer Scrooge (get it? 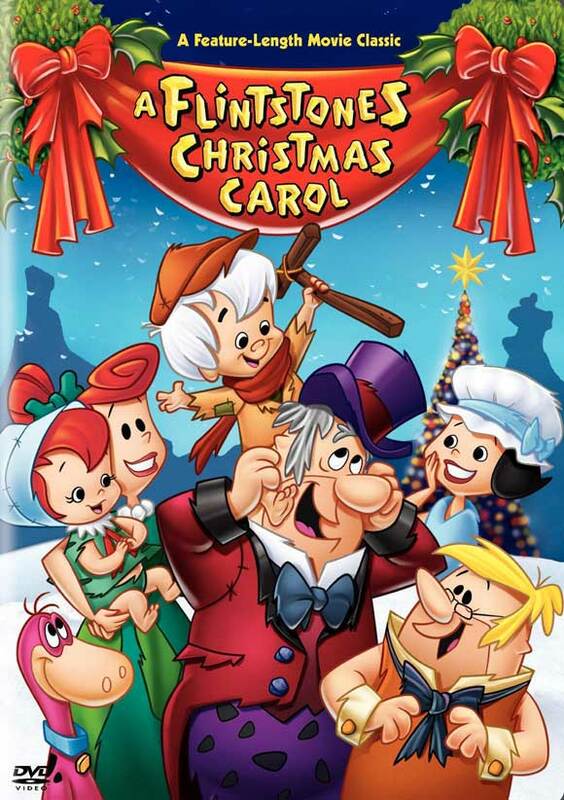 ), the Christmas Carol cast includes Barney Rubble (Frank Welker) as Bob Cragit, Betty (B.J. Ward) as Mrs. Cragit, Bamm-Bamm (Don Messick) as Tiny Tim, and Fred’s boss Mr. Slate (John Stephenson) as Jacob Marbley. Wilma gets called upon to play several parts as the actors drop out, including Belle and Christmas Past. The other Ghosts and the rest of the significant roles are filled by obscure or new Flintstones characters. Thoughts: This film came out at a weird time in Flintstones history. It was the same year as the weak live-action Flintstones movie, and a year after two made-for-TV Flintstones movies which featured Pebbles and Bamm-Bamm as adults getting married, then having babies (twins). For them to step back to the classic era of the cartoon the next year was an interesting choice, but seeing as how they’ve done very little (by which I mean nothing) with the older versions of the characters in the two decades since, I imagine this film was their quiet concession that the characters work best frozen in the eternal forms they enjoyed in the classic TV series. This is all to say: it’s a pretty good movie. The Christmas Carol segments are relatively faithful to the book. The characters are true to themselves and they each fill the expected, suitable niche in the story. After watching nine different Christmas Carols though – eight of which are more or less straight-up retellings of the novel – it’s a nice change of pace to see this rendition. With the wraparound story, we don’t actually start the retelling of A Christmas Carol until a full 16 minutes into this 69-minute film. Once we actually get there, it’s nice to see some real “acting,” such as it is. Fred as Scrooge, for example. While it’s true he’s often a loud, obnoxious blowhard in the classic cartoons, he’s almost never pictured as being particularly stingy or cruel. In fact, the character’s biggest fault is that he goes to outrageous extremes in an attempt to provide a life far beyond his reach for his wife and daughter, hardly the actions of a traditional Scrooge. To compensate for the fact that Fred-as-Scrooge isn’t as obvious a comparison as, say, Scrooge McDuck, the movie takes its time to show you how being the star of the play has inflated his ego. Now they’re playing off an established character trait to turn his friends and family against him, making him a better fit for the part. The Fred-centric subplot runs throughout the film, whenever a scene of the “play” ends. He comes offstage bragging about the applause he’s gotten, frustrating Barney and Wilma to no end. It gets even worse when intermission hits and he realizes he left the presents he bought for Wilma and Pebbles at the store, then races out of the theatre to try to fetch them. He winds up having to break into the store, only to get busted by the police. Lucky for him, it’s his buddy Philo Quartz (Rene Lavert), who’s playing Christmas Future and needs to get him back to the theatre in time. During Christmas Past, the actresses playing both the Ghost and Belle get sick and have to drop out, leaving Wilma to play the roles. Although we get the usual scenes of Scrooge in school, partying with Fezziwig (Barney again) and ultimately losing Belle, there’s an added subtext here. Wilma is legitimately pissed, and Fred – still focusing on his starring turn – can’t understand why. Christmas Present is the only scene where the Bedrock Bug doesn’t cause havoc. Brian Cummings voices “Ernie,” the ghost who shows him the party at nephew Ned’s and the tender scene at the Cragit home. I know I made the same crack about the Flintstones celebrating Christmas in a time before Christ last year, but this time it’s really glaring. Barney delivers the old line about Tiny Tim hoping people remember “who made lame beggars walk and blind men see.” It’s a beautiful line, of course, one of Dickens’s best, and a vital reminder of the true reason for the Christmas season. But still, Barney, how can people remember a man who hasn’t been born yet? Ah well. Sacrifices must be made in the name of great cinema. Christmas Yet to Come is traditionally hooded and silent, and shows Scrooge the traditional scenes. The big curve ball here doesn’t come until the play is actually over, when Fred goes to congratulate Philo on his performance only to find that Philo got struck down with the Bedrock Bug, and Christmas Future was played by none other than his old pal Dino, putting in the greatest canine performance since Rin-Tin-Tin. In the end, Pebbles (voiced by Russi Taylor) steals Bamm-Bamm’s “God bless us, everyone” line when he gets stage fright. The play over, though, everybody quickly turns on Fred. Fred apologizes to Wilma and the others for real, and they eventually, begrudgingly forgive him. This is the only spot where the movie falls flat. Although we see Scrooge going through his traditional redemption cycle, there’s never anything that indicates any sort of redemption for Fred. It’s as if Scrooge’s life lessons somehow apply to Fred as well, and work their magic on him. Even if we’re to assume that’s the case, why is the lesson only hitting him now, on the night of the performance, instead of the weeks of rehearsal leading up to the production? It doesn’t make a whole lot of sense. Speaking of the production, let’s hear it for the Bedrock Community Players, can we? Their stage values are absolutely phenomenal. Somehow they have a full-size reproduction of the city on their stage, along with living dinosaurs and real snow, to say nothing of how they somehow make Fred and the Ghosts turn transparent in full view of the audience. I don’t mind tell you, friends, I’ve done my share of community theatre, and there have been times when we have it rough enough just trying to get the fog machine to work. If we could make our actors intangible, people would be abandoning New Orleans to see our performances in droves. This is not, by any stretch, one of the all-time great productions of A Christmas Carol, but if you’re a fan of the Flintstones – which I am – it’s a fun little departure from the norm and worth watching each Christmas season.